For California districts, the Distance from 3 (DF3) value for students can be found in the Predefined Objective Analysis Report. The DF3 value is the number of scale score points below or above the Lowest Scale Score in the Standard Met (Level 3) performance level range. From the Top Menu Bar, select Reports. The default setting shows the list of Predefined Reports under the orange tab. Click on Objective Analysis in blue or on the view icon (eye) to the far right to go to the report. Note the descriptor statement for this report. Or, from the Launchpad, click on the REPORTS flip card. On the flipped side, select Predefined Reports, then select Objective Analysis to go to the report. Assessment Name and Summary data. Data Filters: Change Roster. Use this to view a previous year’s roster. Data Filter: Change Assessment: Use this to change assessment to Math or ELA Smarter Summative. Search Filters: Options depend on user role. Click on Refresh to view results. Filter Students: View specific subgroups of students. Full Screen: Expand the screen to full screen view. Create Group: Create a student group based on the results of the report. Student Search Box: Enter a student’s last or first name to view results for that student. Results will display to the right of each student’s name. Click on the header once to reorder the students from lowest score to highest score. Click again to reorder students from highest score to lowest score. Student groups can be created to support re-teaching and reassessment. Reorder the columns as desired, then check the box next to each student who should be in the group. Add Students to New Group or Add Students to Existing Group, and then click Save. Click OK in the confirmation message. Please refer to the Help document, Groups: Managing and Creating Student Groups, for more information. Click on a student’s first or last name to go to the Student History Report for that student. Click on the STATE Assessments tab to view the student’s Smarter Summative results. 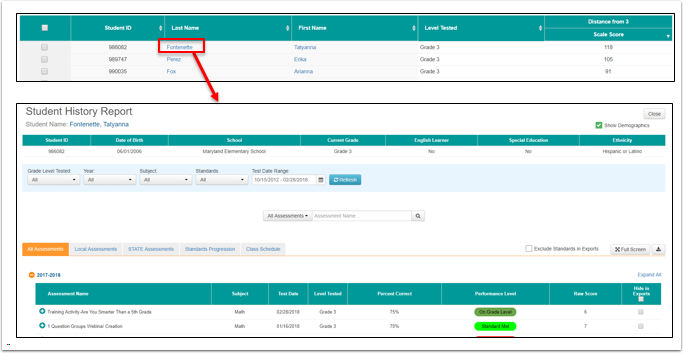 Click on the green circle to open the results to view the student’s Claim results and Distance from 3 for ELA and for Math. Click on the orange circle to close. Please refer to the Help document, Reports: Student History Report, for more information.